During New York City’s “Summer of Hell” — a hot mess of expected transit delays sparked by track work at Penn Station — look up to the heavens for an astrological guide to commuting. If track closures, crowds and traffic are thwarting your everyday routine, consider a Zodiac guide to realizing your journey. 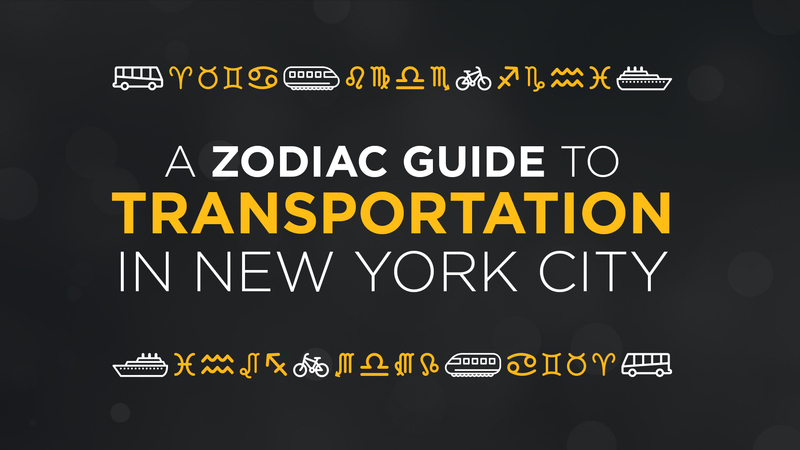 As THIRTEEN’s resident astrologer, Tess Brock (AKA audience development analyst at WNET) has divined which mode of transportation will suit you best, based on your Zodiac sign. Get daily transit updates by following #DaysofDelays, @MetroFocus and @NJTVNews. Also check out our serious transit tips and rundown of changes to Amtrak, NJ Transit and Long Island Railroad services. Aries, your self-sufficient mindset makes you reluctant to rely on anyone but yourself to get you from point A to B. You are always in the driver’s seat, whether that be in life or in your car during your daily commute. Your kind heart makes you willing to pick up friends along the way, Aries. Well, as long as they aren’t back seat drivers. Taurus, you are not one to be spontaneous, and you enjoy your fixed schedule. The steady routine of waiting and sitting aligns with your simplistic lifestyle, which makes you the ideal bus rider. Though delays can be frequent, your patient philosophy and well-focused energy allow you to leisurely enjoy a book or simply the view with every stop. Cheers to the bus, Taurus. Gemini, your personality is like a ride on the ferry: fluid and dynamic. Being out on a deck, feeling the air on your face, restores your strong energy. With your attractive ardor at its peak in summer, you’ll be snapping photos of passengers with the skyline, laughing and making friends along the way. Cancer, you may be used to getting slack for being moody. But when you have the right mindset, you are the most adaptable of all the zodiac signs. This flexibility will allow you to master the always changing subway service. When your subway halts due to mysterious delays, take a deep breath to channel your emotional issues and all will be well. There is always another line to transfer to. Leo, your warm spirit radiates like a New York City subway platform in summer. Even with its delays upon delays, you thrive on the subway system. You love to be the center of attention, especially in large crowds. So put on your best outfit, Leo, head underground and feed off the energy of those who can’t take the heat like you can. Virgo, your meticulous manner makes you the perfect bicyclist. Every detail from your helmet to your reflective gear to your lock has been carefully planned out. Once you take to the road, your extreme caution makes for a safe ride, even as cars buzz around you and other cyclists fly in the face of traffic rules. Focusing on your commute is key to you Virgo, but don’t forget to enjoy the ride. Libra, you thrive in the city because stretching your legs to get somewhere is your preferred mode of transportation. Your balanced approach to the world comes from activity and reflexion. Even in an environment where people are constantly scurrying by, you remain at peace, knowing you will reach your destination fulfilled spiritually. We could all learn a bit from you, Libra. Scorpio, let’s be honest. You could do well with any transportation, but you are indeed happiest when you are effortlessly sitting in the passenger seat. Car ride services and shares are tailored for you, Scorpio. But with one wrong turn, you are sure to release your sting with a 1-star rating. Sagittarius, walking the city beats out any other mode of transportation for you. Your adventurous and independent nature allows you to find those hidden gems of underused side streets and the best bodegas. So keep up those walks, Sagittarius. You’ll be sure to impress your friends by showing them unchartered territory. Capricorn, you are one independent soul, and the bicycle is an ideal vehicle for your ambitious goals. You are a careful planner, so you’ve committed to memory every street you will turn on before you start pedaling. Your fiery temperament may make you reluctant to share the lane with others (especially on the Brooklyn Bridge). But dear Capricorn, this is New York, and you must make way for every tourist that stands obliviously in the bike lane. Aquarius, you are known for being observant and intellectual. Perhaps a ride on the bus is just what you need to nurture your philosophical nature. Be attentive to those around you, and you will be surprised by how much you learn. Maybe your commute will be the inspiration for your next great project. Sit back, and let the bus be your muse, Aquarius. Pisces, you were made for the water. The ferry is the perfect option for you to get between boroughs or even travel within one. Let your hair down, enjoy the breeze and your creativity will flow with the currents of the Hudson, East River and New York Harbor. But beware, Pisces, that your imagination doesn’t take you too far out of reality. With all the new and changed ferry routes, you may end up in the wrong place if you don’t pay close attention. Your fellow star signs will appreciate your feedback on how your commute is going. Share your journey’s story and clock how long your commute was on the #DaysofDelays tracker. Be sure to check our helpful transit tips and rundown of changes to Amtrak, NJ Transit and Long Island Railroad services.